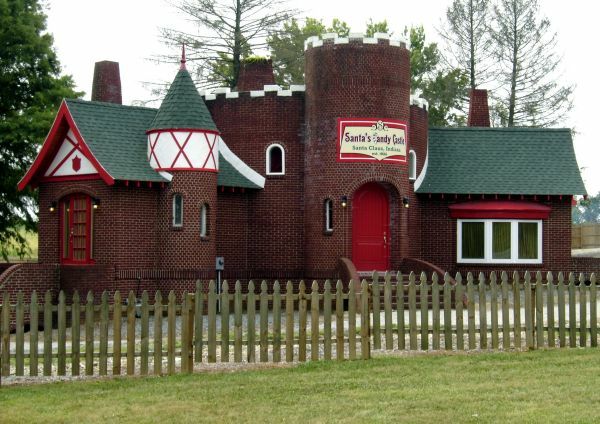 Santa’s Candy Castle was the first attraction in Santa Claus Town, which is purported to be the first and oldest themed attraction in the United States. Dedicated on December 22, 1935, the castle was originally sponsored by the Curtiss Candy Company of Chicago, creators of the Baby Ruth and Butterfinger candy bars. Designed by artist Emil Straus to look as though it were lifted from the pages of a fairy tale, the red-brick building has all the elements of a castle including a crenellated tower, a turret, and a rotunda. Santa Claus Town was the vision of Vincennes entrepreneur Milton Harris, who saw the potential of Santa Claus, Indiana’s unique name after its post office had been featured in Robert Ripley’s famous Believe It or Not cartoon. Harris leased almost all of the land in and around the town and secured sponsorships from leading national toy manufacturers. Santa Claus Town was officially launched with the dedication of Santa’s Candy Castle in 1935, and would quickly be expanded with the addition of the Toy Village and Santa’s Workshop. The Toy Village and Santa’s Workshop were added in 1936. The Toy Village featured over a half dozen miniature fairy tale buildings, each uniquely designed and sponsored by a prominent national toy manufacturer. Santa’s Workshop was a unique building with turrets on either end housed an actual wood shop where Santa Claus himself could be seen making wooden toys with his elves. All the toys were made by hand. Santa Claus Town brought national media attention and thousands of tourists to the tiny town of Santa Claus, Indiana which had less than 100 people at the time. It directly led to the creation of the town’s Chamber of Commerce as well as the town’s first newspaper. Santa Claus Town also caught the attention of rival entrepreneur Carl Barrett, leading him to build the town’s famous Santa Claus statue, which still stands on the highest hill in the town today. Santa Claus Town would serve as a strong influence for other themed attractions that would later appear throughout the United States from New York to California. Santa Claus Town is currently in the midst of an extensive restoration effort. The buildings of Santa Claus Town have long been used for other purposes. They were vacant and in disrepair when St. Nicholas Development, LLC purchased them in 2005. The local company is currently planning to restore Santa’s Workshop of Santa Claus Town and plans to once again make the building a family-oriented tourist attraction.